They made eleven awards to stylish hotels, restaurants and bars, which have made an effort to attract guests with disabilities. Plus one for the most ludicrous loo, which was apparently a crowded category! Blue Badge Style is a website and app which aims to connect disabled clients with stylish venues where they can be confident of an accessible welcome. Winners span the country, with the Dakota Hotel in Glasgow winning Best Boutique Hotel and Bryn Williams in Cornwall winning Best Budget Restaurant. There were many triumphs for venues in listed buildings too. The Beaumont won the Blue Badge Style & Historic England Award for Best Listed Building for its combination of art deco and accessibility. Too often people with disabilities don’t go out because they don’T know what to expect when they get there. Places like the German Gymnasium make it easy and elegant. They won the Best Loo award for having all the right facilities, but getting away from the clinical style of most disabled toilets. The design of their loo is as stylish as the rest of the restaurant and even has cool music and wallpaper! No.1 Duke St is accessible and in an old building. It has an exemplary disabled toilet, plus a lift installed for the upper floor. The ramp into the Bellanger bar area and the low tables make whole place inclusive. It’s often difficult to find good facilities the further afield you go. But Bryn Williams at Porth Eirias has a well-designed disabled toilet and great access. The German Gymnasium is so easy to access and nowhere is out of bounds due to an internal lift in this listed building! Typically German, in the best possible way! The Dakota hotel in Glasgow has an accessible bedroom on each floor, which is unusual. South Place is stylish and exceptionally accessible, but the best bit is that you can see all of this by looking at their website. The Grand CafE, on the ground floor of the German Gymnasium, is the best area and close to the amazing disabled toilets. Far removed from the normal plain white clinical disabled loos the design of these loos is entirely in line with the rest of the restaurant. Competition was stiff for this award. There were loos which were just big rooms with no grab rails; loos where you needed to be an orangutan to use the rails and ones where the doorway was too narrow to allow a wheelchair in! By contrast, Tom’s Kitchen had all the right kit, in the right place. But the loo had been used as storage space, so it was impossible to use. If they only took the junk out and advertised that they had a decent loo, they might attract some guests with disabilities. The Beaumont has maintained the style of this Grade II Listed art deco building and yet also made the whole place accessible. One of the best restaurants in Europe, the Steirereck combines style, beautiful architecture and accessibility brilliantly. In putting in a lift for employees and visitors at the iconic front steps, The Bank of England has gone above and beyond the call of duty to make this listed building accessible. Charlie Lyons has designed elegant access into previously inaccessible buildings. By creating a lift that retracts stairs and magically transforms them into a wheelchair lift, he has benefitted countless people with disabilities. You can look for accessible and stylish venues on the Blue Badge Style website (it will open in a new browser window). It is actually a legal requirement under the Equality Act 2010 to make “reasonable adjustments” in order to provide access for disabled customers – “ a law which is all too frequently disregarded. You can listen to a podcast interview with solicitor Jonathan Fogerty about using legal resources to improve access, here. And disabled access crusader Doug Paulley has developed useful tools to encourage others to demand their legal rights – you can read more here. 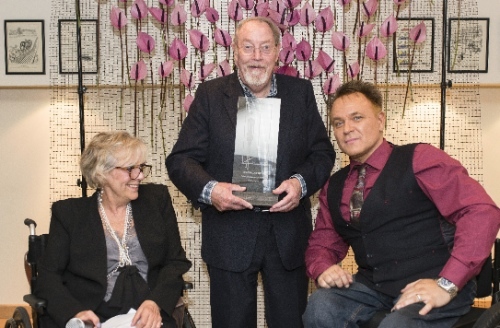 This article was sourced from the website Independent Living UK (full copy) and the original article can be found at First Blue Badge Style Awards.